Pictured L-R: P&E Wing Managing Director Maureen Droney, and mixers Dave Pensado and Manny Marroquin, at Larrabee Studios on Wednesday, May 6, 2015. Photo courtesy of The Recording Academy®. © 2015. 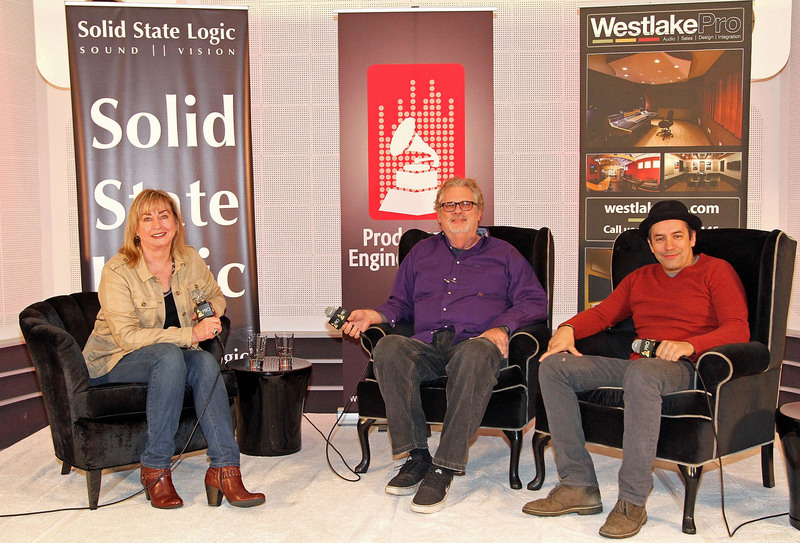 Pictured L-R: George Horton, Vice President, Western Region, Solid State Logic; Dave Pensado; Manny Marroquin; Maureen Droney; and George Adjieff, Westlake Audio CEO. Photograph courtesy of The Recording Academy®. © 2015. Santa Monica, Calif. (June 3, 2015) — On Wednesday, May 6, 2015, The Recording Academy® Producers & Engineers Wing®, hosted a special Up Close and Personal event at Larrabee Studios in North Hollywood. Over 100 pro-audio VIPs gathered for networking and a rare and exclusive conversation with top mixers Manny Marroquin (Bruno Mars, Rolling Stones, Imagine Dragons) and Dave Pensado (Beyoncé, Christina Aguilera, Kelly Clarkson, Elton John, and co-host of the hit web series Pensado's Place). The event was held in Larrabee's new STUDIO 5, the recently renovated facility adjacent to the rest of Larrabee, formerly owned by legendary engineer/producer Bill Schnee. The historic control room and elegant live recording space are renowned for their design and acoustic properties, which have been carefully preserved in the renovation, which now boasts an SSL Duality console as well as an updated lounge and common area. "Manny and Dave are always inspirational," commented Droney. "It was great fun to get them together, and especially wonderful to present this event at Larrabee, which has played such a key role in both of their careers. Larrabee remains one of the world's top studios, and it keeps that position by constantly innovating and improving. The addition of a classic recording room to the facility continues the Larrabee tradition of excellence and also serves to provide a beautiful live space to expand on the facility's repertoire. We thank Dave and Manny, as well as Larrabee and studio manager Amy Burr, along with all of our sponsors, for a memorable evening." Photo Caption 1: Pictured L-R: P&E Wing Managing Director Maureen Droney, and mixers Dave Pensado and Manny Marroquin, at Larrabee Studios on Wednesday, May 6, 2015. Photo courtesy of The Recording Academy®. © 2015. 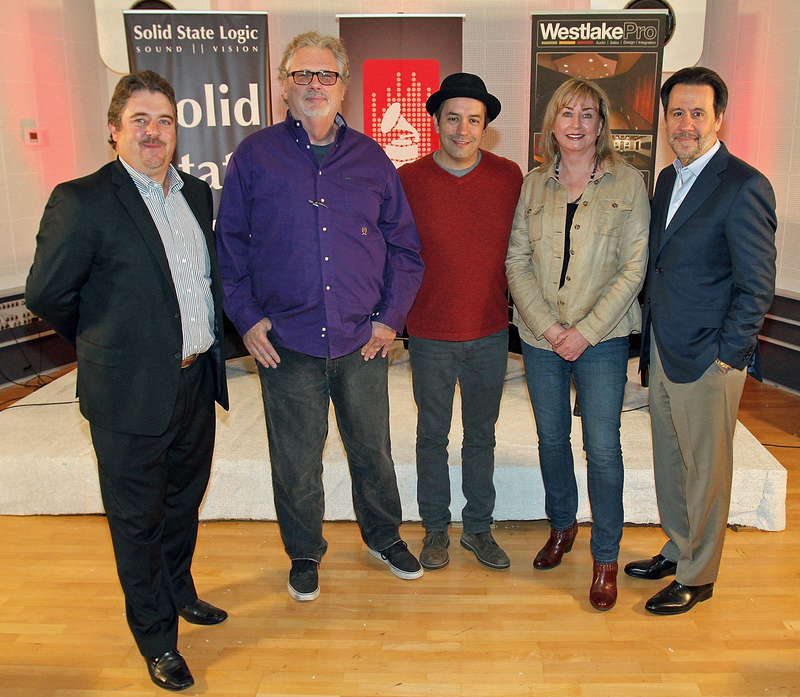 Photo Caption 1: Pictured L-R: George Horton, Vice President, Western Region, Solid State Logic; Dave Pensado; Manny Marroquin; Maureen Droney; and George Adjieff, Westlake Audio CEO. Photograph courtesy of The Recording Academy®. © 2015.